This is the story of Major Greg “Pappy” Boyington, who led VMF-214, a cracker jack bunch of World War II pilots who became known as the Black Sheep Squadron. 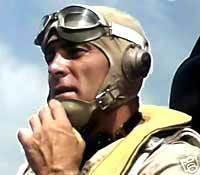 Although some elements of the war ace’s life during this time were Hollywoodized, much of the story is true. As presented in Baa Baa Black Sheep, Major Boyington, looking to form a squadron in the South Pacific, recruited men who were under threat of court martial for crimes such as drunkeness, fighting and disrespect of military protocol. None of these seemed much like crimes to the 35 year old Boyington (he was called Pappy because of his age) as he had often been guilty of them himself. While it is true that the real Boyington was a hard drinking, hard fighting renegade, some of the members of the real Squadron took exception to their TV portrayal as deadbeats. This caused a rift for a time between the fliers and their former commander. In the first season, we find the 214 stationed at Vella La Cava. When not in the air, they are living up to their name of “black sheep.” Boyington exercises little discipline when they are on the ground. But he expects much when they are on the trail of the Japanese. The group quickly gets a reputation for aerial prowess, racking up many Zeros “splashed.” Some of Baa Baa Black Sheep’s best moments are the scenes of the Corsair’s flying. Even though some of it is stock military footage, the scenes are thrilling nonetheless. And the restored Corsairs used in the show were fun to see. 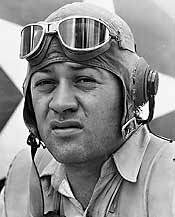 Pappy Boyington must report to Col.Lard, USMC (Dana Elcar). He is contemptuous of Boyington and his lack of respect for the rules. This has some basis in fact and Boyington’s real life nemesis was Lt. Col. Joseph Smoak, operations officer of Marine Air Group 11. The supporting cast consists of many who would go on to other shows: John Larroquette (Night Court, John Larroquette Show), Larry Manetti (Magnum PI), Robert Ginty (Falcon Crest), Jeff MacKay (Magnum PI, JAG). Dirk Blocker was Dan Blocker’s (Bonanza) son and Red West had been Elvis Presley’sbodyguard. 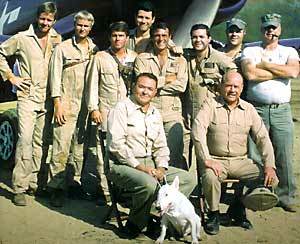 Baa Baa Black Sheep was cancelled after the first season but the network’s Fall lineup went down like a Zero in flames, so the show got picked back up for another 13 episodes under the title “Black Sheep Squadron.” This year they add nurses and the focus migrates away from the combat elements often enough to annoy purists. No doubt this was somebody’s hot item to expand the demographic. They even billed the nurses as “Pappy’s Lambs” an obvious jab at their competition on ABC – “Charlie’s Angels.” Nurse Nancy Gilmore is played by Robert Conrad’s daughter, Nancy Conrad. Dana Elcar died in June of 2005. Boyington served in China as a member of the American Volunteer Group, the famed Flying Tigers. In 1943 with Boyington as CO and Major Stan Bailey as Exec, the 214 trained hard at Turtle Bay on Espritu Santo. They made their reputation in just 84 days, piling up a record 197 planes destroyed or damaged, troop transports and supply ships sunk, and ground installations destroyed. And that’s just the big stuff. Boyinton’s best day was September 14, 1943 when he claimed 5 kills in one day. From that day through January of 1944 he claimed 22 kills. While this number is in dispute by a few kills, he was still the ace with the most kills. In 1944 he was shot down and spent a year and a half as a Japanese POW. Gregory Boyington was awarded the Congressional Medal of Honor. He died in 1988 of cancer. Based loosely on the story of World War II Marine flying ace Gregory “Pappy” Boyington, Baa Baa Black Sheep was a short-lived series that nonetheless still has a big following. Perhaps it is all those F4U Corsairs engaged in aerial battle that stirs the patriot in us all. Baa Baa Black Sheep follows the exploits of the 214, a bunch of hard fighting, hard partying misfits who were spared court martial by Major Greg “Pappy” Boyington played by Robert Conrad. With a disdain for rules and a knack for getting into trouble, the 214 redeems all their bad behavior with their superior flying skills and ability to “kill” Japanese Zero aircraft. When not in the air, the boys were at Vella La Cava in the South Pacific, where they found plenty of trouble to engage them. In truth, the Black Sheep Squadron did exist, although they were not the bad boys portrayed in the TV show. Their flying skills were not exaggerated. Boyington was a pilot of uncommon ability and is credited with more planes shot down than anyone else in World War II for which he received the Medal of Honor. The show was effectively cancelled after the first season but NBC’s Fall lineup was so bad that they brought it back for 13 episodes as the Black Sheep Squadron. Someboy must have been afraid the Baa Baa part sounded like a kids show. While showing its age a bit, the combat footage is still exciting. Some of it was new for the show and some is stock from the military. Watching how vulnerable pilots were in WWII, it is easy to see why they are known as The Greatest Generation. The DVD package contain 2 double-sided discs each in their own case. 10 episodes including the 2 hour pilot. This is not the full first season, which is regretable. The transfers are good, certainly a vast improvement over what the History Channel ran a few years ago. While there are few special features, they have included some old NBC footage of actual interviews with the real Pappy Boyington. 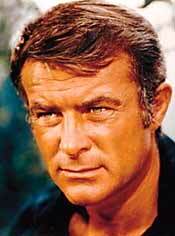 I loved watching him with Robert Conrad and wished there had been more on his life. Perhaps in a future DVD release.